LEED isn't resting: they've just launched a Pilot Credit Library. As you may know LEED's system allows for a limited number of innovative credits to be applied toward a building's rating. These innovative credits establish their own criteria, and then are approved or rejected by the USGBC. The credits are then put in a database online for other architects to research and maybe replicate. 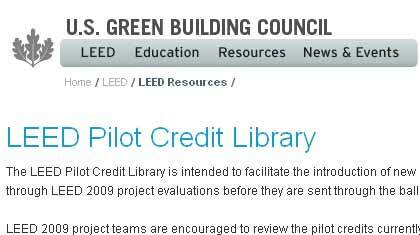 With the Pilot Credit Library, LEED is taking this to the next level. They are formalizing the innovative credits so they are easier to find. And, more radically, they are crowdsourcing the criteria. It's a Wikipedia approach that may entirely negate the need for versioning their credit system: the credits simply keep getting revised by the LEED members and the USGBC review process. It's brilliant, simple, and will make upgrades more responsive to technology and what users are interested in. That last part is key: if people are really serious about energy efficiency, then they can think up some revolutionary awesome credit, use it as a Pilot Credit, and get it approved so that others can take the same route, without having to do all the research. It's a chance for designers who want to push LEED in a particular direction to take action. Have at it, folks.